Hey guys! Remember way back when, before the chaos of the holidays began, before the arctic cold hit the East Coast, I started talking about that crazy idea of getting into a bathroom renovation just before Thanksgiving. Well, it’s several months later, and it’s finally coming together. I never know for sure how things are going to look in the end when I’m in the midst of planning a remodel. I like to think that I do, but really I’m never 100% sure, ya know. There are so many decisions to be made, and they all start to depend on each other and blur together. It makes me antsy! But what can you do but either live with watcha got or dive in and hope for the best. I’m happy to report it’s looking so good, and we’ve almost got this one checked off the list. She sure shines up pretty! 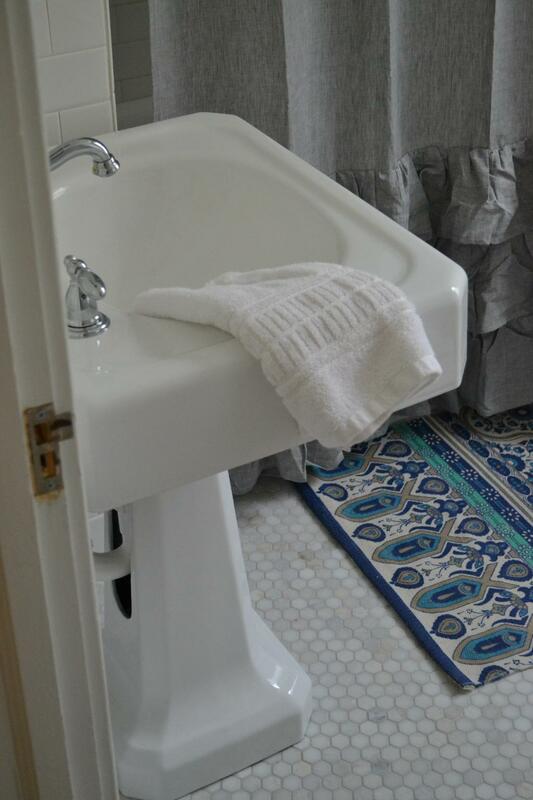 The vintage sink was refinished by a professional refinishing company. They are scheduled to come back for a touch up next week. And our super awesome neighborhood plumber installed all of the chrome hardware. 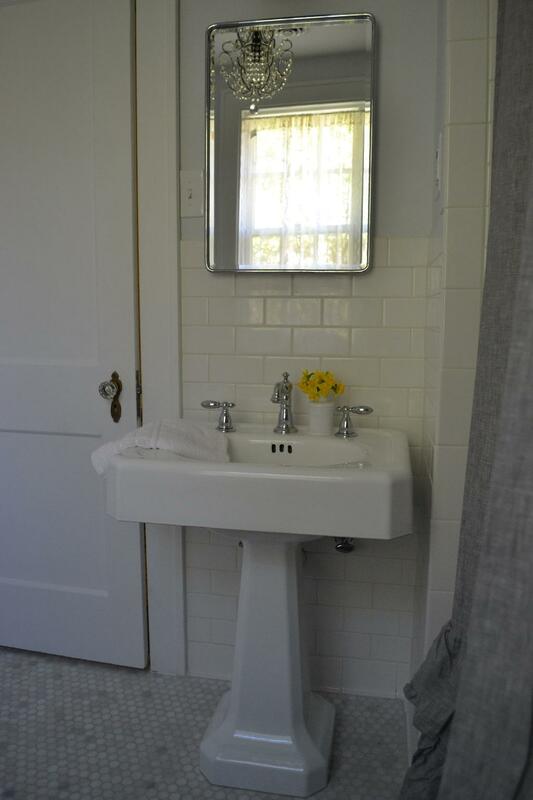 The Delta faucet looks so good with the vintage shape of the sink. We had to go for a widespread faucet to fit the holes from the original hardware. We can now have warm water, not just scolding hot or icy cold, out of two separate spigots. Happy dance time! I love this old sink so I got a little hung up on the idea of keeping her. When we realized a cabinet vanity with storage wouldn’t fit in this teensy little space, it was a no brainer. 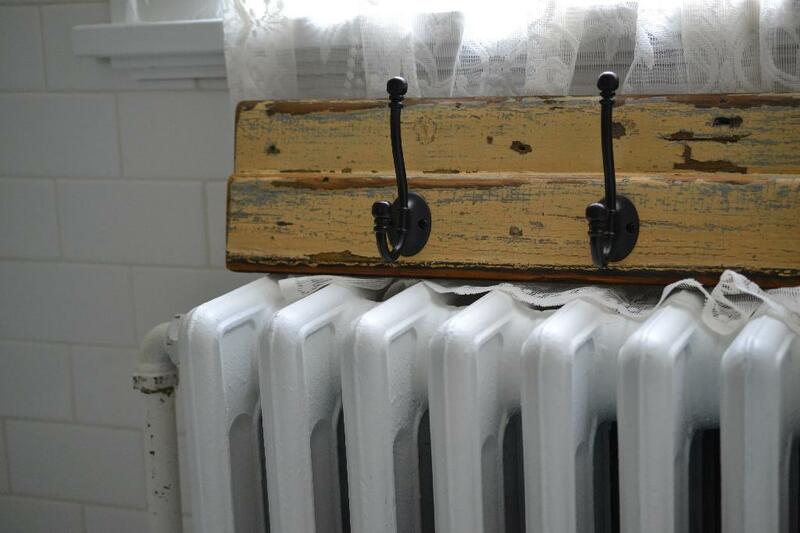 We are also made a row of hooks out of salvaged barn board and new hooks from Lowes. I haven’t decided exactly where in the room it will hang. I’m thinking maybe on the back of the door. It’s a pokey little bathroom and I’m quickly using up every square inch. I’m hoping one row of hooks will be enough to accommodate the kiddos’ bath towels and a hand towel. Next up, a few details that are each becoming little projects of there own. I was disappointed when I realized the chippy paint cabinet was too big and not going to work. I had my heart set on that old chippy beauty so it was annoying to scrap it and start over. So I decided to use the “original to the house” cabinet. It’s really a better size for the space anyways and it will be nice to keep. We are stripping it down, through several layers of paint and wallpaper. Yep, someone wallpapered the cabinet at some point. Weird. So we really only have just a few small projects left. Which sounds like the perfect time to take a break to me! Grin. We are taking this coming weekend off. There will be no measuring, hammering, or even painting going on around here. We will be relaxing and recharging. When we get things going again,, I’ll be sure to share the entire bathroom remodel, along with a shopping list. That will be a sweet day. 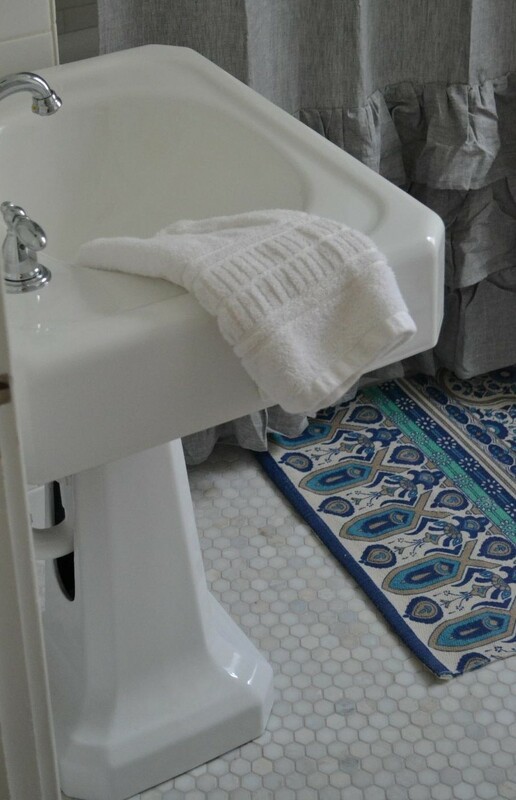 This entry was posted in cottage makeovers and tagged accessories, bathroom, DIY on March 24, 2015 by sally. 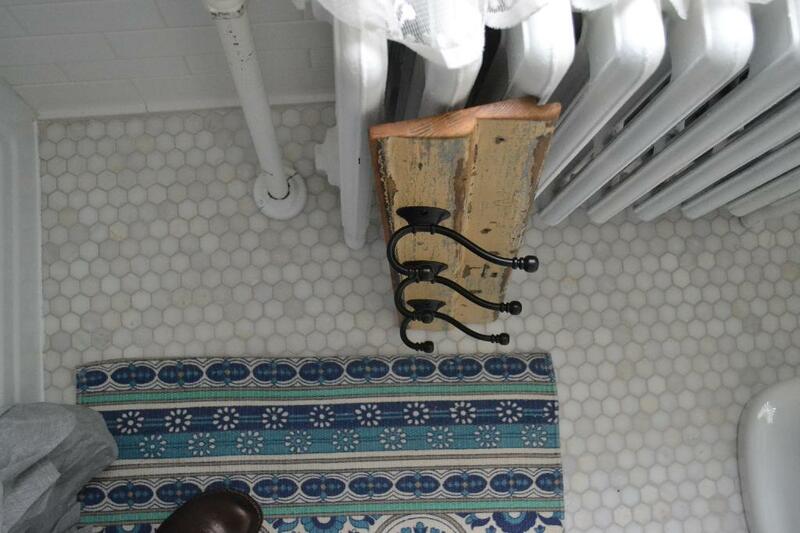 So wonderful to see that you have lovingly restored some of the original pieces in your bathroom. BEAUTIFUL job! The bathroom remodel is beautiful. I am excited to see the big reveal! Lovely bathroom – love that faucet. I was looking at Delta’s site the other day for a similar kitchen faucet. I love how easy it is to change out the seats and cartridge in a Delta when many years down the road, a little drip or handle leak happens. 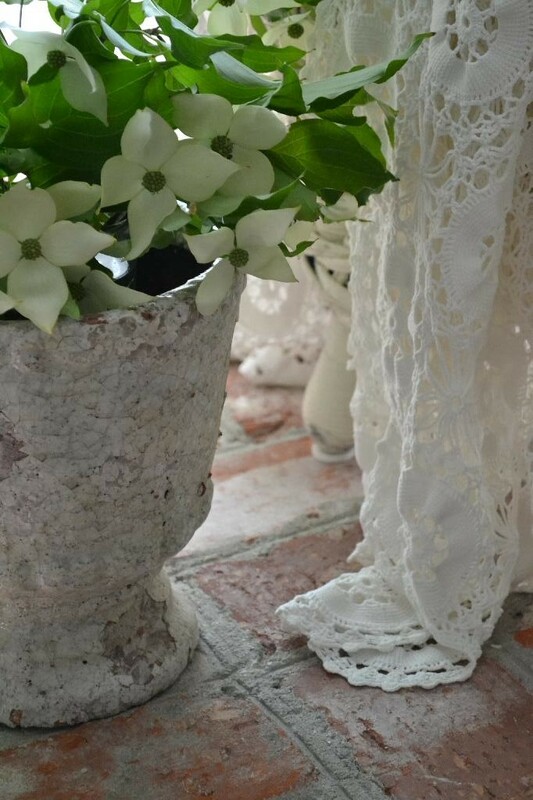 Love the peeks into your bathroom!! The sink turned out beautiful and what’s not to love about the hook rack. 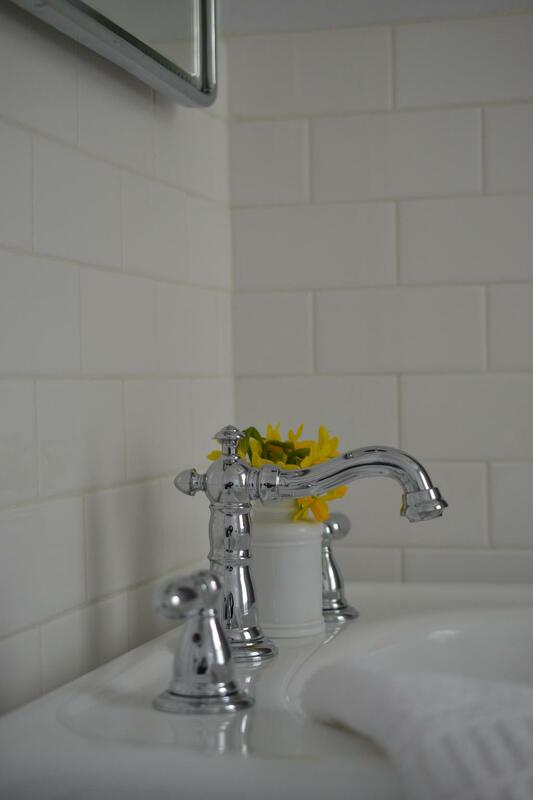 You’ve really kept the vintage charm of your bathroom while modernizing the function. 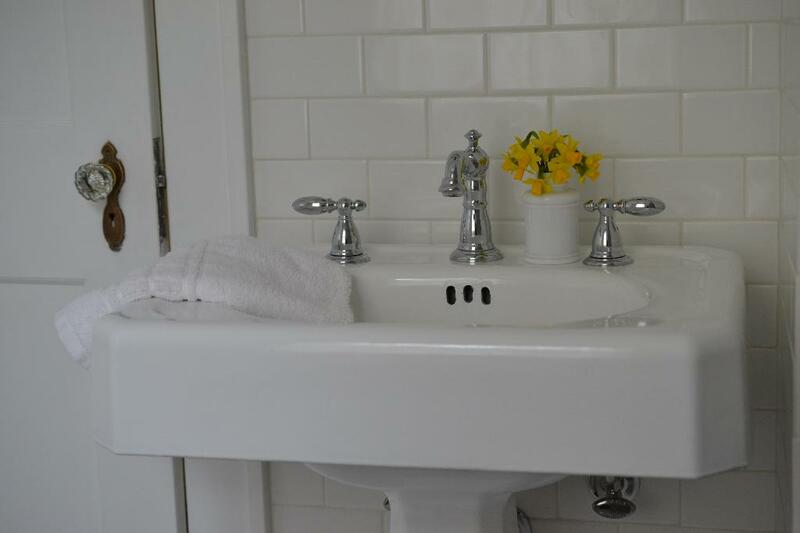 Your sink looks fabulous as do the floors and wall tiles! Your chippy towel hanger will be a fun addition to the room. 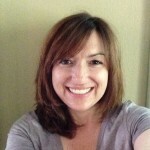 Enjoy your “time off” from the remodel, Sally! It is looking absolutely beautiful Sally! 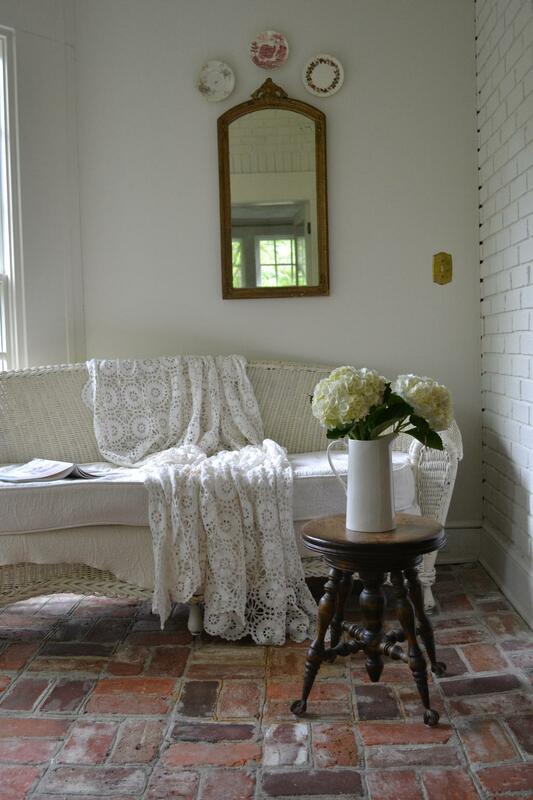 Love the gorgeous old sink. Thanks so much! 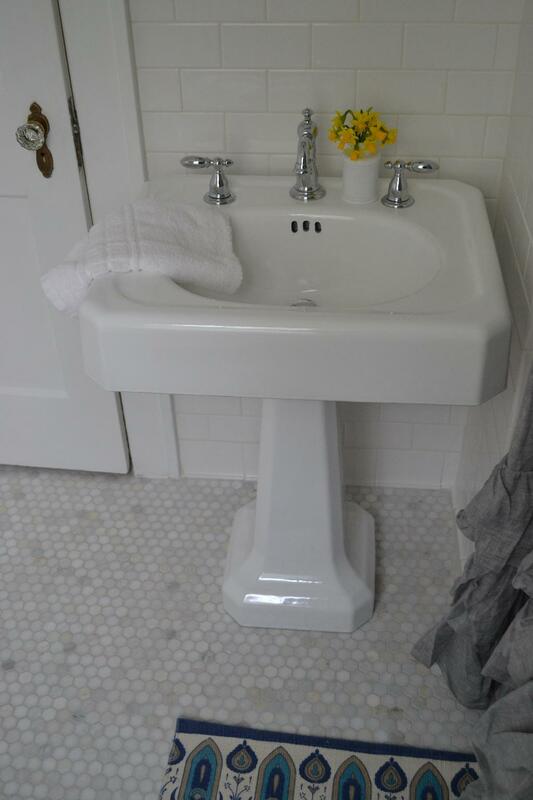 I love the old sink too, I was so happy we could find a way to make it work. Time plays a beautiful part in Creating beauty. Your bathroom is wonderful, love your sink all the way down Tom he hexagon tiled floor. Things are looking very pretty. I adore the sink, how wonderful that you were able to reuse it. Can’t wait to see the whole room finished! cottage fix breaks the rules!